Become the People Magnet You’ve Always Wanted to Be! Want to make an unforgettable first impression? Or learn how to speak in a way that makes you stand out in a crowd? Or find out what signs a love interest might give if they’re attracted to you? 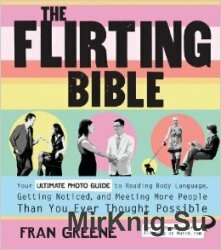 You’ll learn all of these flirting secrets and more with The Flirting Bible, your definitive guide to using and reading body language and other social cues to find instant adventure, friendship, fun, and romance. Nationally renowned relationship expert Fran Greene, former advice columnist for Match.com, will walk you through her thirteen tried-and-trusted techniques for becoming the most confident and attractive person in the room (no matter if you think you are or not! ).